1. The deadline for the latest Is My Blog Burning? contest. 2. My beautiful, Le Creuset Doufeu arrived. 3. A Sunday morning meeting downtown. I’ve never managed to get it together for an IMBB? contest before, but I was intrigued by the chosen ingredient of tea and wanted to submit (my first!) entry. Despite the freakish 90 degree weather we’ve been having in Seattle, I also wanted to test out my doufeu. Since my meeting this morning was a block from the Pike Place Market, I went in search of some sort of protein. My favorite meat market, Don & Joe’s Meats is closed on Sundays, so I wandered into the bottom level of the Corner Market Building to find a brand new (6 months old) butcher called Fero’s Meat Market (94-A Pike Street). The bone-in pork shoulder looked so amazing that I couldn’t resist. 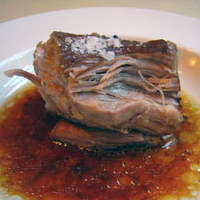 Once at home I wondered what I could do with pork, tea and a doufeu. I found some delicious smelling Samovar Blend Tsarina (No. 817) from SpecialTeas and brewed a strong cup. It was smoky and a little bitter so I added a tablespoon of honey and then poured it over the pork roast. I added a little salt, a little pepper and a bay leaf, then filled the lid of my doufeu with ice cubes and slid it into a 300 degree oven for three and a half hours. The result? An impossibly tender pork roast that fell off the bone; I literally carved it with a spoon and the meat fell into shreds as I ate it. There was a prominent and lovely bay flavor with smokey undertones from the tea. Your new pan and pork look stunning, Meg! Great job! Is the doufeu superior to an ordinary dutch oven? Reid, I can’t wait until the fall/winter when it’s cooler and I can leave my oven on for hours at a time! Thanks Augustusgloop! I tend to exaggerate a lot, but in this case I’m not even exaggerating… it was the most tender pork! Mmm, the pork looks delicious. I like the idea of smoking it with tea. Great idea Megan! I love the name too. I feel so pretentious just saying it… doe-feu! I got mine for a pretty good deal on eBay… about $100 less than normal retail price. Kevin, I was wondering the same thing. I’ll have to do some side-by-side comparisons when the weather cools down. I mean, obviously pork will be pretty tender if you cook it for four hours—no matter what you cook it in. But I was shocked that after that long NONE of the cooking liquid had evaporated and it wasn’t burnt, so I suspect that the doufeu did its job properly and basically self basted the roast the entire time it was in the oven. Which is pretty cool in my book! Thanks Saffron! My original recipe idea involved smoking duck over tea leaves, but once the doufeu came, I just had to try it out. Doufeus and dutch ovens are great for that technnique. They baste really well because the little dimples on the lid let the steam condense and drip down off of them evenly. A lot of dutch ovens don’t have dimples or spikes so make sure you’re buying what you want. The pork looks really great, too! Yes, the dimples rock! 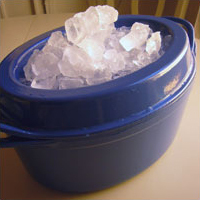 I’ve never owned a Dutch oven… can you also put ice or water on top to increase the condensation? Depends on the lid. The classic dutch oven has a flat lid, so that you can pile coals on top as well as underneath to help bake more evenly. 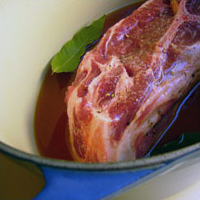 Either way, if you’ve got enough braising liquid in there, it shouldn’t be an issue. Cool. I’ve never cooked with a Dutch oven before. Since you’re using coals, does that mean it has to be cooked outside? Or can you do it in a fireplace or something? Sounds like fun! Traditionally, they had short legs that would keep the bottom off the coals a bit and you would put a few coals on the lid, too. The handle would let you lift the lid off with the coals intact so you could check on your dish without having to remove them first. They work great in a regular oven too but a fire place sounds like a cool idea, as long as you using food-friendly coals and not burning pine or one of those waxy logs, of course. 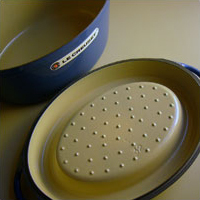 I should mention that you can also bake a flat bread or biscuits on the lid as well if you’re cooking a stew in the pot. That’s so cool. Makes me wish I had a fireplace. Please try it out so I can live vicariously. Hi Megwoo – your pork looks outrageous! I’m imagining the tender meat coming off the bone… I’ve never seen the Le Creuset, sounds fantastic. Thanks Keiko! I heart my doufeu! Le Creuset has outlet stores. Can, perhaps, save $ on purchase.